Calendar and Linked permissions are included as Data Permissions. It is important that you understand how these permissions are different from the Read and Write Data Permissions. Previously, a user had to have either read or write access to a form in order to see if had been scheduled for an athlete. Now, you can enable permissions for each role that allow the user to see if an event is scheduled on the athlete's calendar page. You can now enable a professional or a coach to see when an event is scheduled for an athlete, even though they are not allowed to see any of the data in the form( e.g. they don't have read or write access to the form) by giving them access to a "Calendar" permission. In addition to having a read, write and delete permission, you can select a "Calendar" permission now. 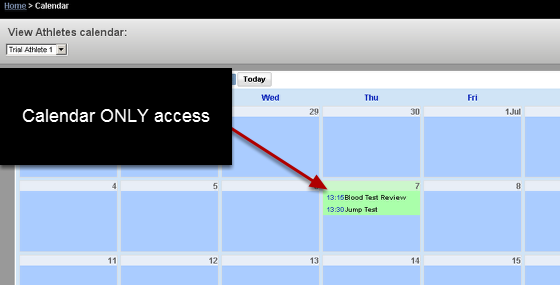 Once you enable this permissions, if this event is scheduled for an athlete then it will appear in their calendar page. The event form won't appear in the athlete history, or reports or sidebar, it ONLY shows on the calendar so you can see if the athlete has an appointment or training session scheduled. See the image in the step below for an example. 1b. You can see here that the permissions set in the step above to see the "Calendar" permission for the Blood Test Review Field ensure the entry appears on the calendar. The coach or other professional will not be able to see the data from the event form, only that it has been scheduled. Calendar access ensures you can manage your athlete's schedule more effectively and avoid scheduling in events at the same time. Previously a user would need read or write access to see these events on the calendar, now you can use the "Calendar" permission to keep the data private, but allow for better management. 2a. Administration Site- New Linked Permissions: Set Permissions to see linked data fields (pulled from another event form or profile form) and inform reports where the professional or athlete does not have read or write access to the original form that the data is pulled from. You can now enable "Linked" permissions so that a user can access linked data, even if they don't have read or write access to the Event/Profile form that the data is being pulled from. If a field is a linked value or linked profile value, or an Inform report field in "Form B" that pulls data from "Form A" and the professional or athlete does not have access to "Form A", then any linked fields or inform reports would simply be hidden in Form B. However, now there is a linked permissions where a users can be given "Linked" permission to access the data that is pulled through form Form A, even though they do not have read or write access to Form A (e.g it won't appear on their event data page, sidebar or reports modules). This means when they view Form B (as shown above with the Jump Testing Form) and they have Linked Permissions for Form A (e.g. the sprint testing form), they see all of the linked data and inform report data, but they cannot read or write any other data to the 30m Form Data. If you are unsure, set up a new role and test these out, or ask your trainer. Remember that the permission needs to be set for the form that you are pulling the original data FROM, NOT the form that you are pulling to. The example here shows that we have set "Linked" permissions for the 30m Sprint Form. This means when we view the Jump Testing Form, we will be able to view any linked fields or inform reports that pull the data from 30m Sprint Form (which has already been set up on the Builder Site) to the Jump Testing form (as shown in the image in the step above).